The Chamang Waterfall, I was told by a local during a recent trip there, was Bentong’s well-kept secret until the late 90s when the tourism industry trained its sights on nature’s attraction. 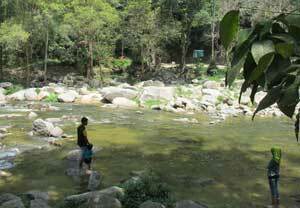 Located some 8km from the Jalan Tras trunk road, this waterfall is among the few attractions that the Bentong district in Pahang, has. For those driving there for the first time, there are adequate sign boards that will take you there even if you do not use Waze or depend on GPS navigation. The road — Jalan Chamang — is also well paved right up to the waterfall area but on some stretches, you have to drive slowly as they are not only narrow but have bends. you to the other bank. There is a parking area near the waterfall which is big enough to park several tour buses. The parking area is located on higher ground overlooking the entrance to the waterfall area. Visitors are charged RM2 which goes to the park’s upkeep per entry. 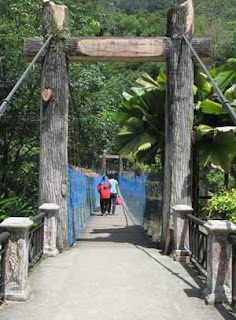 Just inside the entrance, at left, is a hanging bridge that takes you to the other side of Sungai Perting which begins at the fall. There are also toilet facilities. If you want to have a cool dip, locals I met have advised to stick to the pools at the foot of the waterfall which are less treacherous. While the gushing white waters a few levels up look more inviting on a hot day, they are not to be taken too lightly. The rocks are slippery and in some areas, have very little foothold for you. Those who have thrown caution to the wind, like jumping off the rocks and making a high dive, have ended up in serious trouble at some spots. Heed the caution signboards that have been put up near the danger spots; they may save your life. This river is at the foot of the Falls. 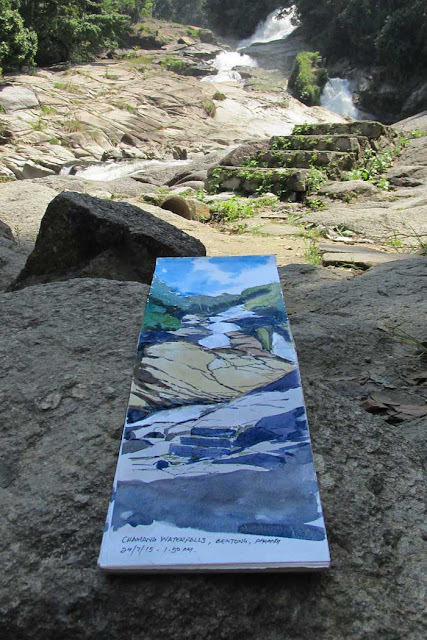 This scene is painted from the foot of the waterfalls. I was fortunate to have the entire area to myself as it was a working week afternoon and the weather has been very kind. 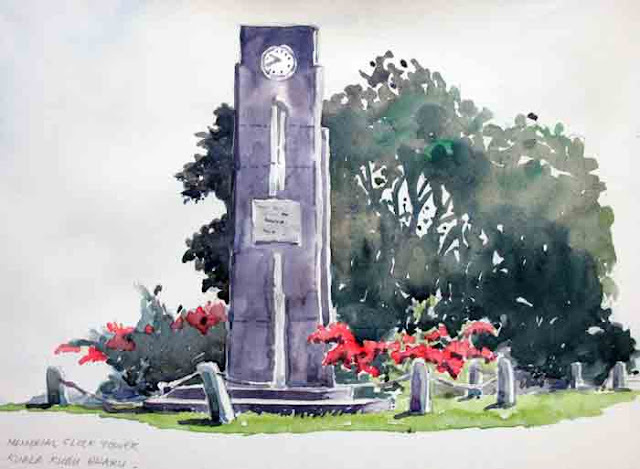 The Kuala Kubu Bharu Memorial Clock Tower was built in 1931 to mark the Coronation of King George VI and Queen Elizabeth. It sits on the hilltop overlooking the KKB town. This memorial clock - looks more like a cenotaph - sits just at the entrance to the Traffic Police HQ. You can't see it from the road below because of the foliage surrounding this structure. This Clock Tower was built in 1931, to commemorate the Coronation of King George VI and Queen Elizabeth.